It’s a bit hard to find. Recently, I asked one of my dive instructors at Aquavision if he knew any good day hikes in the area. I had been feeling the lack of exercise in my body and knew I had to shift the grid. 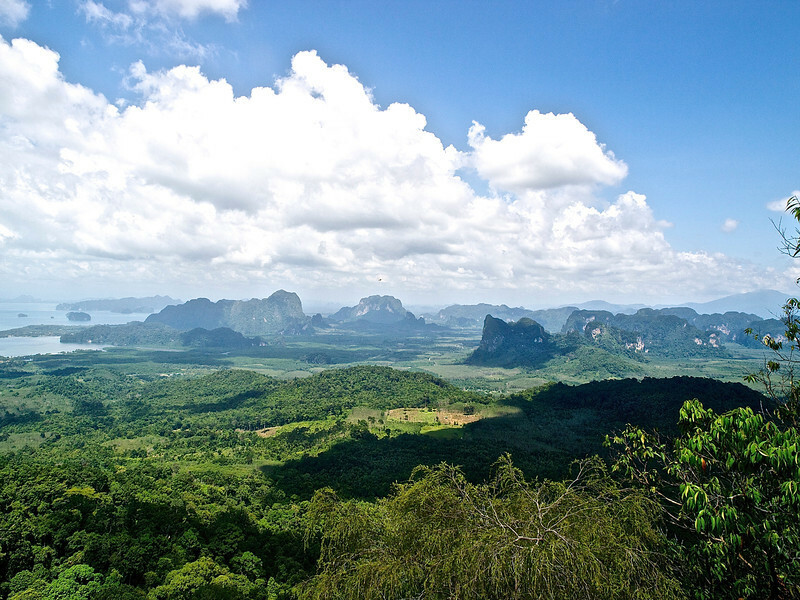 With a nod, a smile and almost a wink, he simply said, “Tuub Kaek.” Using his basic information and rough directions, I set out the following day from Krabi. That morning, I negotiated with and hired a scooter taxi for a round trip knowing I would not find any return transportation at my final destination. We rode thirty minutes passing the turnoff to Ao Nang. We continued another 20 minutes stopping frequently to ask directions. We proceeded to Klong Muang, a very upscale beach resort area with the likes of Sofitel and Ritz-Carlton. We continued to drive along deserted beaches for several kilometers more finally turning inland at Tuub Kaek Beach. We passed a private drive proclaiming it was the Four Season’s Nature Preserve (you get the picture). We continued awhile longer, finally entering a National Park. After about 100 meters, the road ended. The only person around was an older gentlemen wearing a park shirt. He was hanging out in the shade smoking and gave us a smile. This one and only trail marker was at the trailhead. My driver was to wait two hours for me to return. I did not pay him and I got his cell number as an added precaution. As the hike was about 4 km each way, I figured I had time enough. 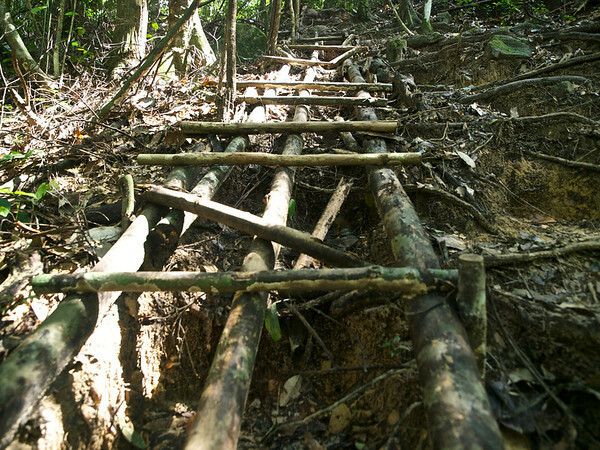 The hike started easy enough with a river crossing and a slight ascent through a mixed bamboo forest. However, the terrain soon steepened. 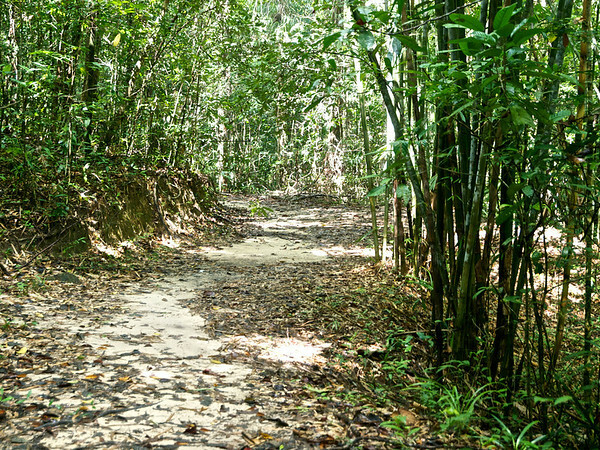 It was hot and humid in the jungle and in no time at all I had worked up a sweat. There was some occasional interpretive signage in English naming some of the plant and animal species. Other than that, there were no trail markers. Some areas were muddy and quite slippery. Other parts were so steep that crude wooden ladders with occasional handrails had been built sometime in the past. These were rotten in places and required patience and concentration. 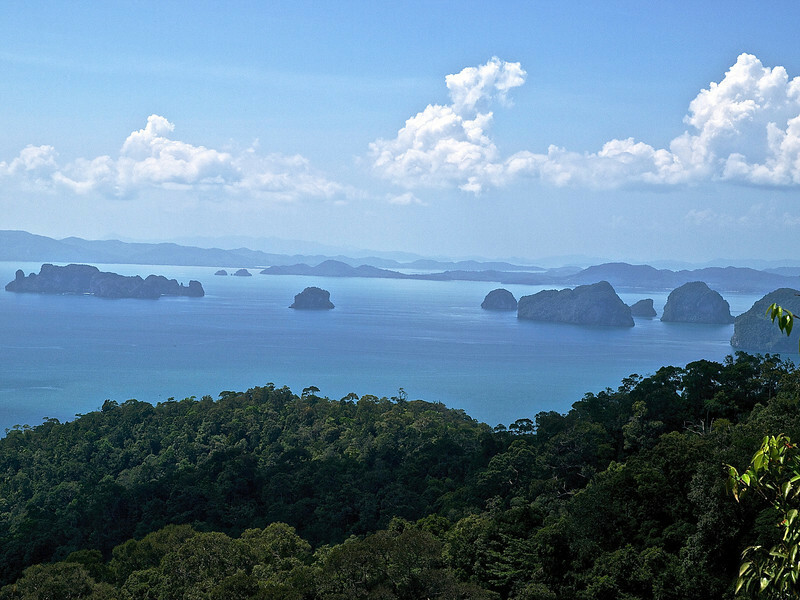 I finally reached the summit and the views over Phang Nga Bay and the Andaman Sea were astounding! I looked at my phone and realized it had taken me two hours and 15 minutes to get up. Amazingly, I got a signal and managed to reach my driver who was fixing to leave. He agreed to stay another hour or so for a deservedly renegotiated price. I took it all in, set up my Gorillapod, shot some photos and busted a move back down. It was an awesome hike. I saw monkeys, several species of birds, colorful bromeliads and lush forest plant life. The view alone was reward enough. Approaching the end, I was hot and drenched throughout. A jump in the river, however, quickly put me right. 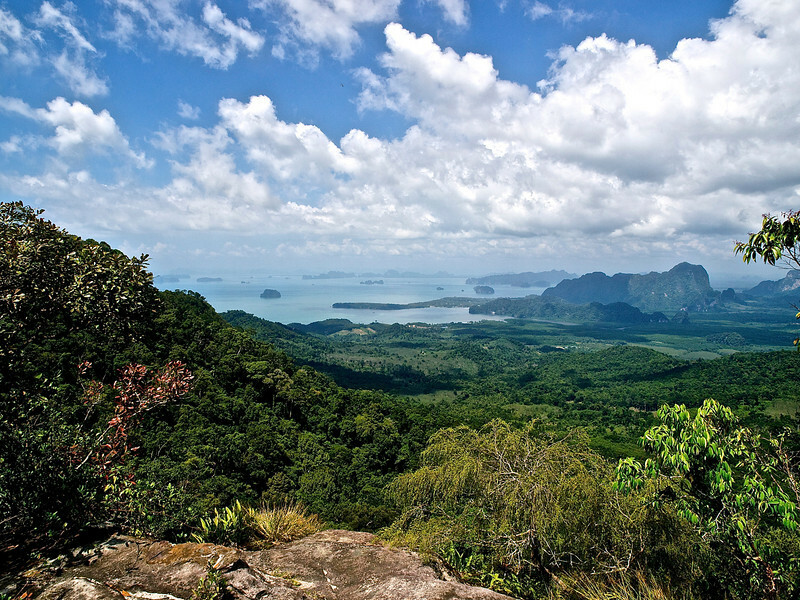 This hike is strenuous and not suitable for inexperienced hikers or small children. Bring two small or one large bottle of water per person as well as plenty of deet. Hydrate frequently. 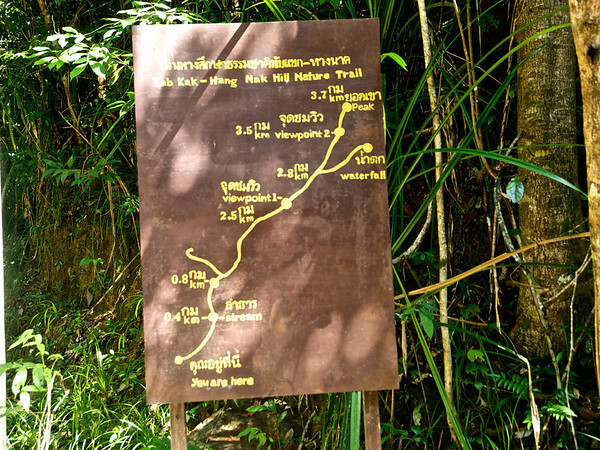 10 Responses to THIS HIDDEN KRABI DAY HIKE ROCKS! Great picture’s as always! Sure glad you managed to get the driver to stick around… sounds like that would have been a LONG walk back! 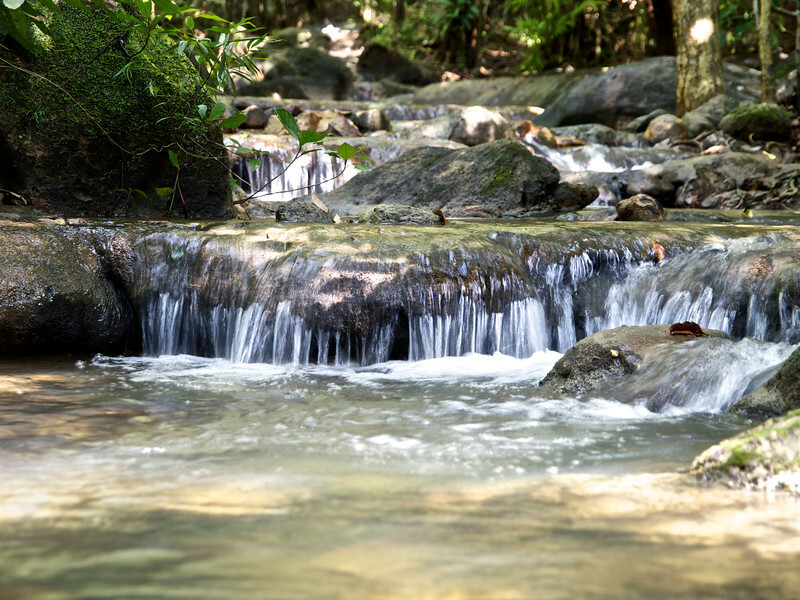 That stream shot look’s like it could have been taken in Big Basin. It would have been a serious walk back Brian! I actually realized I was running long about 7/8 to the summit but there was no cell signal and I figured I came that far, no way I was turning around. It was a huge relief to get that call through. Travel with Phillip to exotic lands use your gift of imagination and be with him, I do. He doesn’t know it but dimensional traveler means both ways – wait a minute he might have known all along. Anyway what a hike, and those views and I got hungry from all that climbing. But sitting down and getting blown away on those panoramic views made it all worth it, sure glad Phillip had his camera, but I had the extra energy bars and Phillip liked that. And did you get a ride on all that wild looking jungle, can you imagine all those exotic butterflies. Well it’s back to the office and a nice cup of java, until next time see you at Phillips world travels – somebodies got to do it and sure glad Phillip volunteered. Thanks Frank. I forgot to mention the iridescent hummingbirds. Agreed Stephanie. And my heart, lungs and legs appreciated the expunge. Wonderful view Philip. The 12-60 again or a different setup? Yep Scott. The 12-60 with the Gorillapod. It was a little hazy from the humidity (not air pollution) as well. Altho I wish we had been on this hike with you, I agree with Frank that the trip at my computer (and in my imagination) was a lot easier. Thanks for doing your usual thorough job with text and pictures. What a find! Thanks Bob. Definitely worth the effort.